Use our online tool to create the perfect pair of socks. You'll never want to take them off (but you should probably wash them). 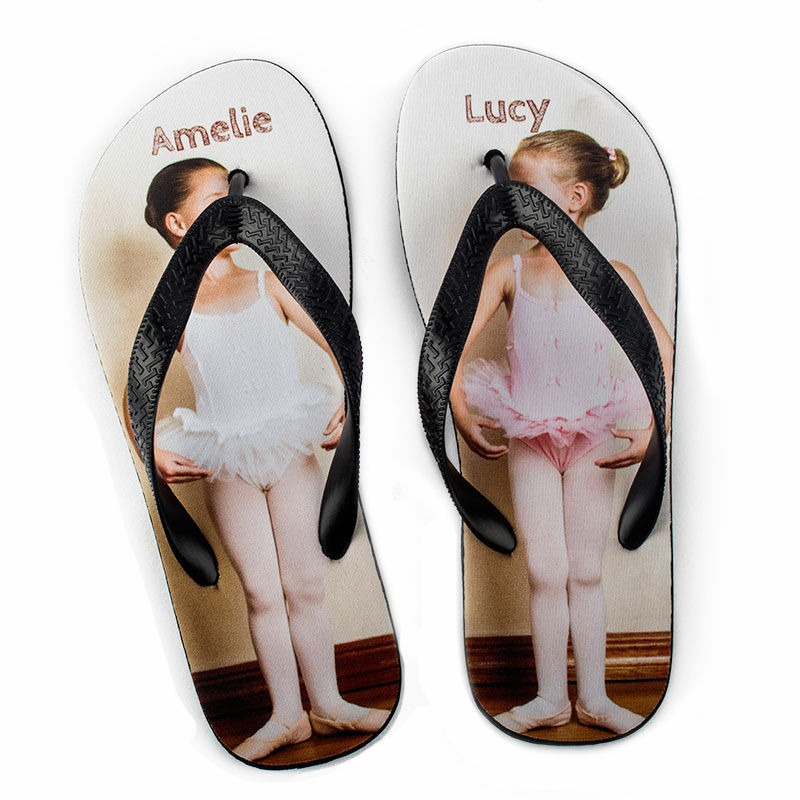 Children's flip flops, are a great gift idea for kids to use on holiday or swim lessons. Print their name and photo for easy identification and to encourage them to walk sensibly around the pool. Made from durable non-crumble foam with your photos printed onto a duchess satin lining, they're the perfect gift for fun-loving children who want to play in the sunny weather. Delivery time: 1-3 days, several options available. We are fast, and print most products in one day if you order before 7am EDT/4am PDT. Excludes delivery time. Our products are lovingly made by our talented artisans. We produce everything ourselves to ensure the highest standards and quality. Soft, spongy and durable, these personalized children's flip flops are a must have for summer days, holidays or swimming lessons. Printed with your photos and text onto the satin lining of each foot, they're a stylish way to identify your child's property. Choose from kids size small, medium or large and let your kids express their individual style at the same time as protecting their feet. The plastic straps are designed specifically to prevent rubbing, which is ideal when little ones are making sandcastles or walking with family. Design your own flip flops and add instant flair to your kids' summer attire. Handwash only, hang to dry. Low heat iron. Care: Clean your children's flip flops with a damp cloth after regular use to keep them fresh and hygienic. Do not machine wash or tumble dry. 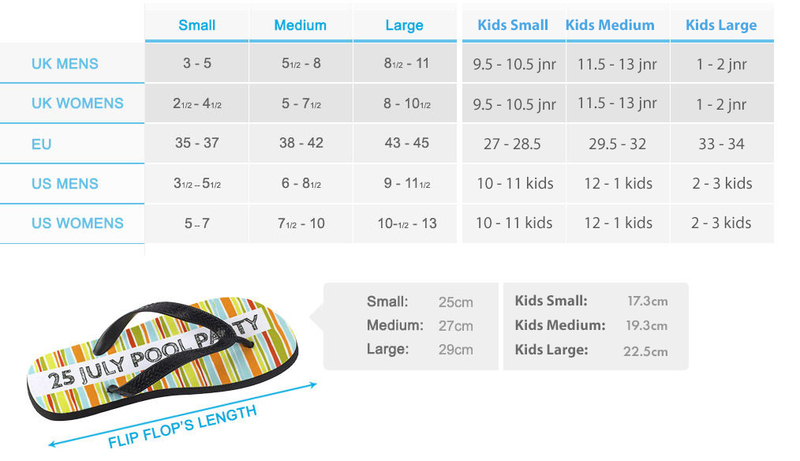 Like many of our products, your children's flip flops come with a quantity discount, so you can get a pair for everyone and save money at the same time. Your flip flops are handmade to order. We take non-crumble spongy foam and cut it to size, including a ridged sole to give your child that all-important grip. Your designs are printed onto sultry duchess satin fabric, which lines the top of the foam to ensure maximum comfort. These flip flops aren't just for one holiday though, as they're durable and hardwearing with a permanent print that won't fade, even with inevitable poolside splashing. The plastic straps are molded to fit around your child's feet, resulting in a gorgeous pair of sandals that look and feel good. Please note that we puncture 3 holes into each flip flop to accommodate the black straps. Within the design interface, upload your photo and click 'product view' to see whether any elements of your design are disrupted. A face might be positioned exactly where the toe separator falls, so if this happens, you might want to readjust your image so nothing is distorted on the print. If your little one attends regular swimming classes, these customized flip flops are ideal as they're easily recognizable and stand out from other generic pairs. Print their first name on the left foot and second name on the right foot for a truly original pair that can't be mistaken for anybody else's. Design Your Own Flip Flops and upload photos from previous family holidays and treat your son or daughter to a pair of totally cool beach flip flops. Friends they make around the resort will be totally jealous of these fun, vibrant sandals. Children love to feel close to their idols, so you could create a design that features superheroes, pop stars or their favorite cartoon characters. For kids who aren't as engaged about their swimming classes, this is a great way to make it a more positive experience. Create a standout look at the beach and wear your very own unique swimsuit. Personalize the front and back of this bathing suit. Design a pair of Personalized Swimming Trunks for yourself or for a fun and unique gift for a special guy in your life. Custom printed personalized scarf, wrap or shawl that you design online. Printed and made to order with your design or photo.